The Christmas Creek Drainage Restoration project is a multiphase effort to restore the majority of blockages on a significant fish-bearing tributary of the Clearwater River in Jefferson County. Throughout the project’s three phases, PCSC has worked with the landowner to remove barrier culverts and associated fill, replace them with larger culverts or bridges, and reshape surrounding land to its natural grade. A section of roadway was also decommissioned and the entire area replanted with native vegetation. 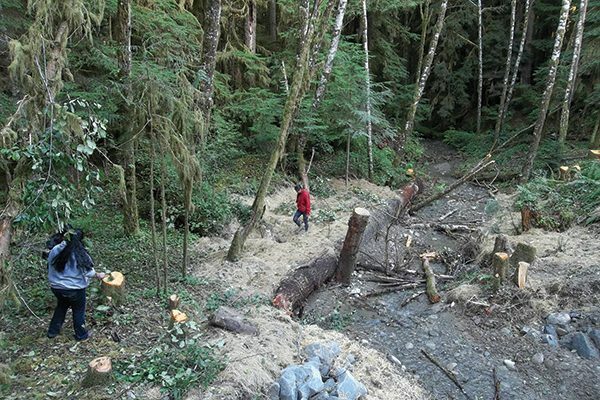 Wood and rock were added downstream to minimize stream regrade and to provide fish access through the project site under all flow conditions. The purpose is to open up previously inaccessible salmon habitat. In total, this work has taken place on just over five miles of stream, comprising several miles of valuable salmon spawning, rearing, and overwintering habitat. The species that will benefit from the Christmas Creek Drainage Restoration work are coho, steelhead, and cutthroat trout. Pacific Coast Salmon Coalition (PCSC) is a grassroots, nonprofit volunteer-based organization whose mission is to be actively involved in local volunteer-based habitat restoration in order to achieve a healthy salmon resource within our region.